Violence is never the answer… unless you’re Charlie Day and you’re challenged to a one-on-one battle by Ice Cube after a pretty terrible day at work. Oh, and if you’re egged on by an army of obnoxious and sociopathic high school students, as well as every other adult around you. Such is the lesson(s) of Fist Fight, a rather dumb hijinks comedy with some pretty bad intentions, and some questionable morals, that by all accounts should be absolutely horrible to watch and a firm early contender for one of the worst films of the year… but I can’t go that far with this film. Don’t get me wrong, this isn’t really a good film when you pick it apart, but I’ll admit – to my own pure embarrassment – that I did get a couple of chuckles every now and then, and had the tiniest bit of fun with this flick, despite myself. The set-up is that it’s the last day of school at what is apparently the worst high school in America, with every single student pulling off dangerous and highly elaborate pranks all throughout the school, each one of them more sadistic and dangerous than the last – there’s a horse on crystal meth set loose in the corridors, some have set up paint canisters to go off whenever someone walks past a locker, and many other expellable offenses – and Charlie Day, playing meek English teacher Andy, is carefully tip-toeing around everything. That is, until he incurs the wrath of angst-ridden History teacher Ron Strickland (Ice Cube) when, after an episode of rage that involves an axe, he rats Strickland out and gets him fired. In response, Strickland challenges Andy to a one-on-one fight after school, the news of which soon spreads amongst the students and teachers, who are all egging Andy on to man up and go up against the feared Strickland. From the first scene, it’s clear that Fist Fight doesn’t take place in any kind of reality that makes sense. In the real world, any student who would cause as much chaos as all the ones at this school do, last day or no, would be penalised and maybe even charged with criminal damage and disruption. The same applies for the teachers, who aside from inciting violence amongst themselves through their own aggressive egos are also psychotic monsters, sexual predators – a recurring joke is of Jillian Bell’s guidance counsellor eyeing up the high school seniors – and essentially terrible at their jobs. But this is a type of film where such shenanigans go unpunished, aside from one incident that actually does involve the police (which leads one to wonder why they weren’t called for anything else in this movie, but that’s the logic this film operates on), so it exists in its own crazy little world. Unfortunately, it just so happens to not be a particularly funny world either; a lot of the jokes fall flat on the floor, and certain actions that the characters undertake make them more despicable than actually endearing (a minor plot point sees Andy try and frame Strickland for drug possession, which is kind of cruel when you think about it), and when it isn’t being really dumb in trying to cram in as much social commentary as it thinks it can – no, seriously, there’s a whole sub-plot about the fight actually being an allegory for the broken school system – it’s filled with clichés and tropes that really have no business being in a film like this. There’s a lot about Fist Fight that doesn’t work, and by all rights I should hate this film with a passion, but I just don’t. Instead, it gets an indifferent “meh”, though leaning a bit more towards the negative than the positive. There were a couple of times where I did find myself laughing at some of the dumb stuff in this movie, and while it was very rare as a lot of the film I was sat there with my arms crossed not really getting into this crazy set-up, those moments were so unexpectedly smirk-inducing that it almost made up for the non-laughter I was experiencing during everything before it. I won’t say that I laughed hard at those moments, but I still found it funnier than some of the other comedies I had to sit through over the last twelve months. So, there you have it: a film that I should rightfully hate, and won’t be arguing anytime soon with people who legitimately despise it, but in the end I chuckled enough at to say that Fist Fight at least went through one ear and out the other relatively harmlessly. 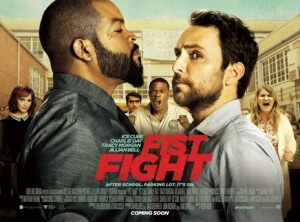 Fist Fight won’t score many points for audiences as it is mostly a humourless, bad-intentioned and insanely dumb comedy, but there might be one or two unexpected chuckles somewhere buried beneath all the manure to prevent this from being completely awful.